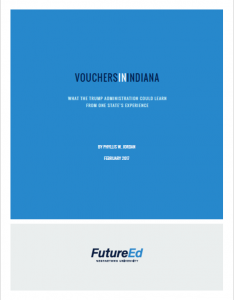 UPDATE: The latest research released in August 2018 shows that Indiana students using vouchers continue to fall behind in math after three to four years. They show no significant changes in English language art. With the White House and U.S. Education Department considering federal support for private school choice, FutureEd took a deep dive into one state's program. Five years ago, Indiana launched a private school voucher program that aimed to provide an alternative to faltering public schools while saving the state money by essentially outsourcing the education of some students. Political leaders and school choice advocates expected achievement would improve as students attended better schools, private schools would expand to meet growing demand, and the state would spend less because the cost of each tuition voucher would be lower than the full cost of a public education. But the FutureEd analysis of the Indiana School Choice Scholarship program suggests that few of the program’s hoped-for benefits have yet materialized. Many former public school students have seen their test scores drop, not improve, after transferring to private schools with Indiana’s tuition assistance. Instead of increasing private school options, a substantial number of voucher schools are simply filling existing seats with students subsidized by the state. Fewer than one percent of voucher students now come from failing public schools, and more than half never attended public school at all. And the state says it is running a $53 million deficit as it pays private schools, most of them with religious affiliation, to educate students. Rather than a model for voucher expansion, the Indiana program should be seen as a cautionary tale for policymakers seeking to strengthen the effectiveness, efficiency, and equity of the nation’s educational system.